The WSJ is out with a muchly regurgitated piece, which may, however, finally end up being right. Turns out the negotiations between bondholders, the company and the intractable UAW are going nowhere in a hurry, and as the company has a February 17 deadline to report on its progress (of which there has been none), it may finally be time to pull the plug. GM's options are asking the administration for more money, which at this point has a one in a million chance of being granted (so I'm saying there's a chance), or filing bankruptcy. The latter should have been the course the company was forced to embark on long ago, as it is the only truly viable long-term option. Hopefully it also takes Chrysler with it. "One plan includes a Chapter 11 filing that would assemble all of GM's viable assets, including some U.S. brands and international operations, into a new company. The undesirable assets would be liquidated or sold under protection of a bankruptcy court. Contracts with bondholders, unions, dealers and suppliers would also be reworked." While everyone is busy arguing over the stimulus bill, without having a clue what its over 1000 pages of "stimuli" include (it is actually split into a 496-page appropriations section and a 577-page tax package), the government is making sure that corporations with public debt trading at a steep discount go out at first opportunity and do open market debt buybacks. We wrote about the recent pick up on secondary debt buybacks here, and now it is likely to become a frenzy due to tax incentives that the bill has in its final form. Fixed income funds are likely to front run companies, resulting in a steep increase in prices of bonds that have the potential to be repurchased. The specific proposal introduced by Senate Finance Committee Chairman Max Baucus (D, Montana) calls for deferrals of taxes on gains from debt repurchases at discounted levels. Any income realized from debt buybacks in 2009 and 2010 will be deferred to 2011 and then taxed ratably over an eight year period, through 2018. Let's demonstrate: if an issuer buys $1 billion of its debt at 50 cents on the dollar, the result is a $500 million capital gain and $100 million tax bill at a 20% statutory rate. With the current proposal, assuming a two-year deferral and pro-rata payment over 8 years, the present value of the tax payments becomes $54 million - a $44 million pick up in value! The difference is substantial and could potentially be distributed pro-rata to the company and its bondholders, implying the repurchase price could be increased by 5-6 cents. This could lead to a whole new form of company-bondholder negotiations, especially for large companies whose debt is trading at a large discount. 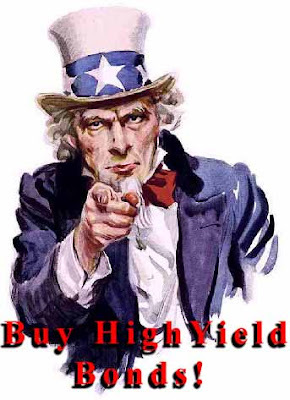 As a large portion of debt trades at distressed levels, with 70% of the HY market and 12% of investment grade trading at distressed spreads over 1000 basis points, this proposal would create large incentives for companies to consider buying bonds in the open market. 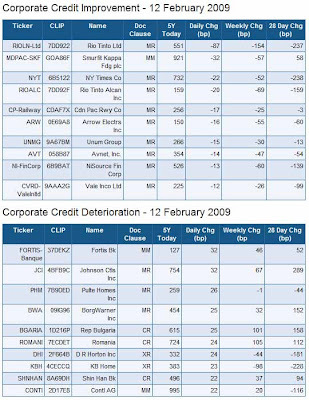 Even prior to this proposal, with its embedded benefits, companies had been aggressively buying back debt over the past 2 months (table below). As we discussed in the linked article, the benefits to a company from open market repurchases are numerous. 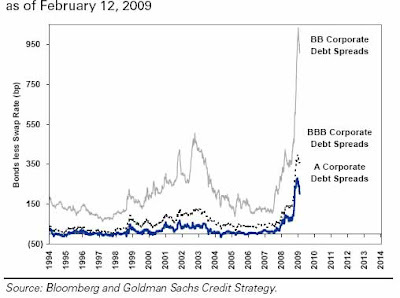 It is likely that the stimulus bill will incite even more companies to buyback their own distressed debt, and asset managers to piggyback on this trend by pre-purchasing the bonds of companies they believe are most likely be bought up in open market repurchases. However, investors will have to be very careful not to misprice the overall high yield market higher, which as we wrote yesterday, could potentially be rich to the tune of 14 points based on a set of expected default and recovery rates. Friday the 13th was not a good day for banks, as regulators shuttered 4 more, after last week's 3, bringing the 2009 total to 13. This is already more than half of 2008's total closings of 25, when it took until September to get to a cumulative 13 shutterings. The closed banks were Pinnacle Bank of Beaverton, Oregon; Corn Belt Bank and Trust Company of Pittsfield, IL; Riverside Bank of the Gulf Coast, in Cape Coral, FL and Sherman County Bank, Loup City, NE. The 4 closings will cost the Deposit Insurance Fund $341.6 million, according to the FDIC. 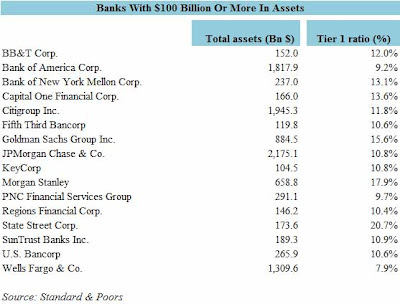 As a reminder, the FDIC oversees 8,384 institutions with $13.6 trillion in assets. It is still unknown how much Perella Weinberg makes in fees for each successive closure. 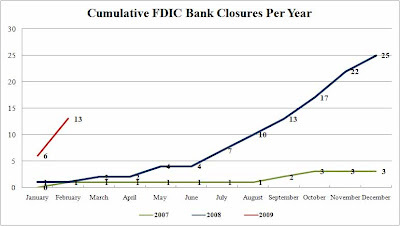 A graphic representation of cumulative closures in 2008 and 2009 ytd is presented below. This effectively means the Trump Atlantic City Casinos are 4 days away from bankruptcy. Feb. 13 (Bloomberg) -- Trump Entertainment Resorts Inc.founder and Chairman Donald Trump resigned from the board over disagreements with bondholders’ decisions and actions. Trump said in an e-mail today his investment is “worthless to me now.” He controls 28 percent of the stock, according to a March 21 regulatory filing. His daughter, Ivanka Trump, also resigned. The Atlantic City, New Jersey-based casino owner skipped a$53 million coupon payment due Dec. 1, saying it needed to conserve cash and hold talks with lenders on restructuring its finances. The deadline has been extended four times since the month-long grace period triggered by the skipped payment expired Dec. 31. Trump Entertainment’s three casinos in Atlantic City have been through bankruptcy twice. The company has been in talks to renegotiate its debt. Holders of most of Trump Entertainment’s $1.25 billion in notes and Beal Bank Nevada, which is owed $490 million, have agreed not to exercise default rights for interest or principal payments until 9 a.m. New York time on Feb. 17. European semiconductor maker NXP, formerly Philips' semiconductor unit which was LBOed in 2006 by a consortium of KKR, Silver Lake and AlpInvest, reported it had drawn down $200 million on its revolver, after pulling another $400 million on November 26, effectively tapping out its credit facility availability. By doing this, NXP joins an infamous club consisting of Freescale, Clear Channel, and Harrah's, all of which recently drew down their available borrowings, scaring bond investors who are left wondering why the companies are in urgent need of expensive cash. As we discussed in the CCU case, this can be taken as a cheap-DIP alternative action, as hoarding cash in this manner traditionally leads to a restructuring. When Reuters yesterday released the rumor of the mortgage subsidy program, the market shot up to close unchanged after being down over 3%. But was the market, as usual, ahead of itself in its optimism? While the news of subsidies may result in some marginal benefits to the most at risk homeowners, it is at best a temporary solution as it does nothing to impact the real toxic asset overhang - the staggering notional size of unserviceable mortgage debt. Additionally, subsidies will obviously not come free. A full estimate of the program's cost can only be made once there is full disclosure on this effort (which aside from Reuters' piece, there has not been any additional confirmation from the administration), but this post attempts to give some rough preliminary indications of how much will need to be invested and whether or not the most recent plan by the administration will even be effective. 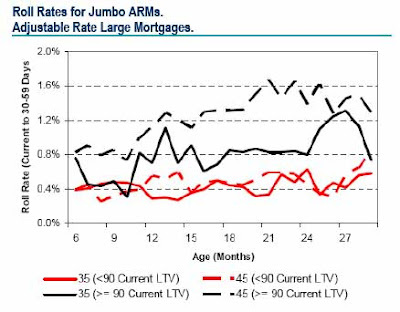 First, we present some interesting data from BAC's mortgage group, which tracks the most at-risk groups, and what current roll rates are for assorted cohorts (roll rate is the percentage of current mortgages of specific age in months that defaults within a month), emphasizing the mortgage types mostly associated with higher than usual foreclosure rates: Jumbo ARMs and Options ARMs. The conclusion is that while principal reductions have a favorable impact on reducing delinquency rates and foreclosures, the impact of interest rate reductions is much less certain and likely will have a very muted effect at best. In the figure below, the dashed black line shows that 1.4% of 24-month Jumbo ARMs in which the borrower has little equity (>= 90% of the Loan To Value (LTV) and where monthly debt payments consumed a large proportion of income (Debt To Income, or DTI, of 45%) become delinquent within a month. The solid black curve shows that for comparable loans, but where the borrower can better afford mortgage payments (DTI of 35%) roll rates decline to 0.8%. The red lines represent borrowers with equity in the home (LTV <90%) - delinquency rates here are lower and much more insensitive to changes in monthly mortgage payments. This demonstrates a mortgage subsidy program would mostly benefit homeowners with Jumbo ARMs and little home equity. Comparing the data for borrowers who spend a large portion of monthly incomes on debt payments (dashed lines) indicates that the biggest benefit would come from principal writedown, as delinquency rates drop significantly for those homeowners who have equity in the home. The brief conclusion is that yesterday's news, even if ultimately confirmed, will be yet another step in the wrong direction by the government, which should be instead focusing on reducing the overall debt burden. 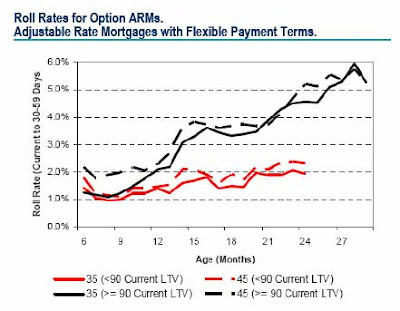 This relationship is even more pronounced when looking at the much more aggressive Option ARM mortgage data. Here the main difference is that in loans with little to no equity (DTI of 45%) there is virtually no roll rate improvement if monthly mortgage payments are made moderately more affordable (DTI dropping to 35%). Therefore, even more pronounced than in the Jumbo ARM scenario, there is no evidence that an interest rate modification program will prevent foreclosures for homeowners with Option ARM mortgages. The only sure way to reduce roll rates, delinquencies and foreclosures (at least based on empirical studies) is to enhance the equity in the mortgage, which can only be achieved via a program of debt principal reduction. 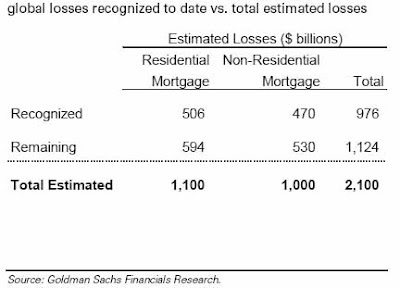 Market estimates of first-lien mortgages expected to be liquidated in this economic cycle approach $2 trillion (out of $9.3 trillion in outstanding total first-lien mortgages). Assuming the new loan modification program can reach these borrowers, and the cost of lowering mortgage rates by 100 bps is 2-4 points, the total cost of the program would be $40-80 billion per 100 bps reduction. As the targeted group of homeowners currently likely has very high mortgage rates due to high DTV and LTV ratios, the program will likely need to lower mortgage rates by anywhere from 2-4%, suggesting the cost of the program could reach $300 billion (or higher), and there is no conclusive evidence it would even lower foreclosure rates. Alternatively, to effectively achieve the desired effect of lowering delinquencies, thereby lowering LTVs, the government would have to impair the $2 billion first-lien tranche, with a 50% reduction here costing $1 trillion. Once again the government is faced with the dilemma: do the effective but expensive thing, or blow less capital on something that very well may not have an impact at all. And if the Reuters article is correct, the government will not disappoint in its continued course of consistently picking the latter option. Warren Buffett has officially turned the corner and while (temporarily) giving up on equities, he has gone full bore into debt. His latest private purchase, after the recent foray in Harley-Davidson, is Tiffany's, more specifically $250 million of 10% Notes which mature in two equal installments in 2017 and 2019. While Harley Davidson stock spiked on the news, it is unclear if Warren is buying bonds in semi-distressed names with the hopes of eventually equitizing his claim through a bankruptcy or comparable reorganization, thereby acquiring the company's equity for free. Having received numerous emails asking for some more info about the highly convoluted relationships between Charter's various entities and inquiries as to why any rational company would have 10+ tiers of debt (ahem, Charter - rational? ), Zero Hedge presents a rather simplified version of Charter's Org Chart. Hopefully this will make analyst lives a little less painful at several large funds (you know who you are). PS. 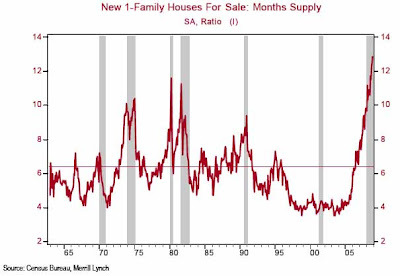 As it was pointed out to us, ZH forgot to cite that this chart is the hard work of one or more still employed BofA analysts who likely had to spend their post midnight dinner allowance as they first created then filled the boxes just the right shade of red. Zero Hedge salutes you anonymous real men of Charter flow charts. We hope fundamental analysis survives long after the market has turned to dust. The stampede of Citadel clients who have been eagerly waiting to pull their money (which, despite a 4.95% up January, is still worth roughly 50 cents on the dollar after last year's performance) will be let loose any day now. Bloomberg reports that in a letter to investors, Kenny Griffin has realized that it is beneath any self-styled master of the universe to keep cash locked up despite loud protests to the contrary. Citadel will decide each quarter whether to make payments from its Wellington and Kensington funds, Griffin, 40, said in an investor letter yesterday. Clients will be notified of any amounts available for redemption. “We believe that this plan will allow us to maximize the value of our portfolio holdings and capitalize on opportunities in the marketplace,” Griffin said in the letter, a copy of which was obtained by Bloomberg News. He said the firm had “significantly” cut its holdings in hard-to-sell assets. Sirius XM just filed this press release stating that unless it manages to complete an exchange offer of its 10% Convertible Notes due 2009 for a like amount of Senior Secured Notesw due 2011, it will have to file for bankruptcy. The exchange of the $400 million issue has already been accepted by holders of $172.5 million, or less than half the total. EchoStar's Charlie Ergen likely holds a blocking stake in the issue, so the fate of Sirius is likely in his hands, and as such as bankruptcy filing on Tueday of next week is very likely. As the U.S. is preparing to issue trillions in Treasuries, with the latest twist being to add to the U.S. debt to help irresponsible borrowers subsidize their mortgage payments, it may want to take a look at Germany, which today failed for the second time (first time being a month ago) to issue 10-Year Bunds (the local Treasury equivalent). The auction fell 20% short of the $7.75 billion Germany tried to raise due to lack of demand. Investors are focusing on higher yield paper from other European sovereigns, as the Bund tried to come to market at 3.28% at which level apparently there is simply not enough demand. A German sovereign bond auction failed yesterday amid growing danger signs for governments as they attempt to raise record amounts of debt to pay for fiscal stimulus packages and bank bail-outs, writes David Oakley. It was the second successive failure this year of a 10-year Bund auction - usually one of the most sought-after - as demand fell 20 per cent short of the €6bn (£5.4bn)the German government wanted. …The outcome signals trouble for governments as a record $3,000bn of debt is ex-pected to be raised this year in sovereign bonds - three times that of 2008. Carl Norrey, head of European rates trading at JPMorgan said the restricted demand for this latest issue - sold at a yield of 3.28 per cent - highlighted the price sensitive nature of government bond markets as investors have ever more debt to choose from. "Price is all important in a market with an enormous supply." With spreads between German yields and those of other eurozone countries close to record wides, investors bought other eurozone paper this week because of the extra premiums they could obtain for this debt. Showing just how stupid the rushed deals to acquire pre-bankrupt companies are turning out to be (see BOA-Merrill Lynch), Lloyds dropped 30% in London trading after announcing it expects recently taken over lender HBOS to post a $14.5 billion loss. “The impairments are, principally as a result of applying a more conservative provisioning methodology consistent with that used by Lloyds TSB,” the bank said in statement. Lloyds Chief Executive Officer Eric Daniels said this week the bank would have done “three to five times” more due diligence on the takeover had it not been for time pressures. Lloyds agreed to buy HBOS, formerly the U.K.’s biggest mortgage lender, in a government-brokered deal in September just days after HBOS came close to collapse when credit markets froze. So basically i) stuff was marked to the moon and now that it is marked fairly, it is killing the acquiring company and ii) the acquiring company totally would not have bought the POS had it actually done some homework. However the precedent set by JPM when it "purchased" Bear after 24 hours of hard diligence is the new benchmark for blowing shareholder capital on worthless garbage. Anyone doing more work than that in multi billion acquisitions is a total tool. At least one man is happy, and not surprisingly, it is John Paulson (as always): a $48 million profit for one position (in which he has a 130 million share short) on Friday 13th is not too shabby. The planets must be in some millennial Friday 13th alignment, as it is finally the case that the high yield credit market is in agreement with rating agency default predictions. As we observed previously the price of the on-the-roll High Yield index (HY10) implies a specific curve of cumulative default probabilities. 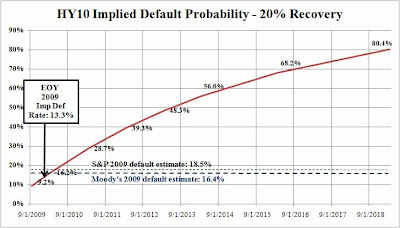 Based on its most recent price of 76.4, the interpolated December 31, 2009 cumulative probability for index constituents is 18.4%, which is shockingly close to the latest prediction out of S&P for speculative grade defaults. S&P estimates high-yield-bond default rates will hit 13.9%this year, but could go as high as 18.5% if the downturn is worse than expected (which it will be). Moody's predicts a default rate around 16.4% this year. The default rates in recent downturns were 11.9% in 1991 and 10.4% in 2002, according to S&P. Such rates peaked at around 15% in 1930. In 2007, when credit flowed freely, the default rate remarkably dipped below 1%, an all-time low. Fitch Ratings estimates the biggest prior year for high-yield bond defaults, in dollar terms, was 2002, when $109.8 billion defaulted. In 2008, high-yield bond defaults topped $66.6 billion, up from $9 billion for 2006 and 2007 combined. Both rating agencies expect defaults to peak in the second half of the year, based on forecasts that the economy itself will bottom out in the first two quarters of the year. As the chart below indicates, the HY10 price also demonstrates that based on JPM's mathematical models, by March of 2019, 90.5% of all current high yield companies will be bankrupt. So whoever is buying a basket of high yield bonds with 10 year maturities, may want to change recovery model assumptions so that only 10% of the companies in that basket will pay off their debt at maturity. Now reader CreditTrader makes a terrific point. The chart above assumes 40% recovery rates which is the default assumption, yet wrong, as recent CDS auctions have shown: a much more realistic recovery assumption in a bankruptcy these days is 10-15%. 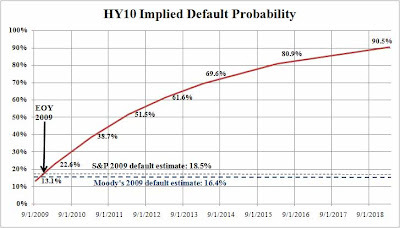 If we rerun the numbers assuming 20% recovery rates (or half the default rate), the HY10 market price implies credit is mispricing default risk significantly! In other words to get to an 18.4% default rate at EOY 2009 using 20% recoveries, the HY10 price has to be 62, or about 14 points lower than today's price, meaning HY credit is very very rich, and all those who are buying bonds in the primary market will get burned very soon. As more defaults result in minuscule recoveries, it is inevitable that JPM will tweak their recovery default rate much lower and this will result in a huge drop in the index trading price. The pounding of Conti AG and Eastern Europe continues. Homebuilders join the fray as the entire sector closed much wider. In the positive category, Rio Tinto shorts get burned, as well as holders of CDS of perennial deathwatch candidate New York Times. The boondoggle party is over... Or at least it is for Bank of Countrywide Lynch. The recent prolapse in populist hatred for TARP recipients means no more fancy conferences at the corners of the world where tequila shots are cheap, ignorant yokels still think banking is cool, and strip clubs are plenty. So as the ever vigilant world of bored bloggers makes it virtually impossible for any associate to enjoy 4 hours in business class, sipping on mimosas and crunching on a microwaved dish of assorted nuts, while pretending to be reading a pitchbook, we think it makes sense to alert the general public of these gratuitous opportunities to blow taxpayer money for worthless banker congregations. Each "conference" is rated along two axes: i) overall boondogglery factor based on geographic location and ii) wanton waste of taxpayer funds, both on a scale of 1 to 10. Market Seems Confused About Definition of "Mortgage Subsidies"
Another insane rally for all the wrong reasons. Mortgage subsidies are an effective debt reorganization, and confirmation of a lack of equity value. LACK, not ABUNDANCE. To be buying stocks on this news one has to believe that the value taken away from equity tranches, taxpayers and through incremental leverage, will be lower than the value generated by subprime borrowers who will go forth and purchase/borrow thanks to having a subsidized home (for a few months at least, until they lever themselves into the outhouse yet again). In the mean time second liens and equity tranches of that same mortgage get wiped out, spilling over into capital markets. I have previously discussed the topic of negative basis trades, specifically as manifested in cash-CDS pair trades. 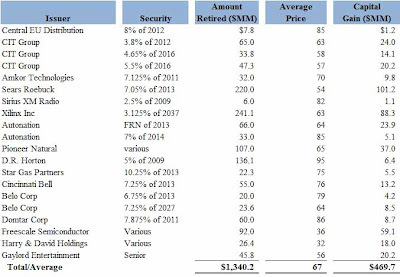 An interesting tangent on the basis trade topic, and one that is causing many index arb funds a lot of headaches lately, is the IG Index basis, or the basis between the IG11 (current on the run) index spread and the wighted average spreads of the Fair Values of its 125 constituents (listed here). If the index trades tighter to its Fair Value, the basis is negative, and an account can fully hedge a basket of equally-weighted IG constituents, while picking up 40 basis points. Historically, the IG index basis has been positive, with a September 15 inflection point, when the basis flipped, reached a peak spread of 58 bps by the end of 2008, and is currently down to 40 bps. 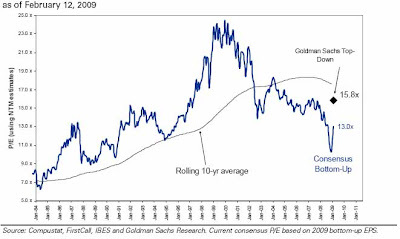 The reason for the historical positive basis was a result of index funds being net sellers of the basis package. The blow up in basis, due to factors which I will present shortly, has made the existence of index arb funds virtually impossible. Curiously, the negative basis collapsed rapidly in mid-January only to rip wider subsequently. The brief blip of rationality may explain why several large index arb funds posted acceptable intramonth January returns; current spread data indicate poor index arb performance will persist. 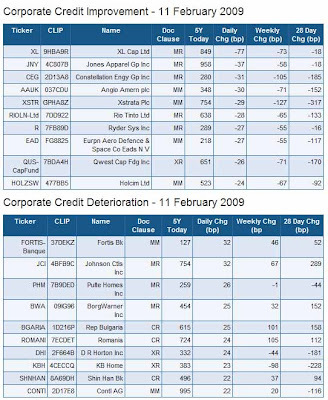 A long, long time ago in Q1 2007, IG8 had a fixed coupon of 35 bps and the widest spread on any of its underlying constituents was 185 (Rescap), with 85% of the portfolio reading inside 60 bps. The current on the run index IG11 trades at a 150 bps fixed coupon, with 62 out of 125 names trading much wider than index strike, and has three outliers that trade on a point up front basis (500 bps running), Textron, MBIA and iStar. The aberration from preponderance of wide "outliers" creates a duration mismatch between the Index and the FV legs. As wide spread names have pronounced convexity, the trade equalization starts to lose practical sense once more and more names escape to the risk stratosphere. The index attempts to compensate for this by readjusting every 6 months, by kicking out outlier names, as the index moves to a new on the run iteration. One can be sure that IG 12 will not hold Textron, MBIA and iStar, as well as at least another 30 current index constituents. A simple way to avoid getting the "Goldman discount" is to take on the jump to default risk yourself. Instead of novating a name, simply purchase the opposite CDS at the desired unwind price. The differential between the in-the-money strike price and the unwind cost creates an annuity whose PV would equal the cash payment from the B/D, however it would stop if and when the underlying reference name were to default. As noted, the IG has a fixed coupon of 150 bps, so any purchases at a wider strike price would result in a net initial cash outflow. Indicatively, purchasing 100 million IG11 at the current 200 bps price would cost $2 million dollars upfront net of accrued interest. Many smaller accounts are unwilling to post such large amounts of collateral apriori. IG11 is relatively liquid, and while a far cry from 2007 when index bid/ask spreads were about 1 basis point, current bid/asks are in the 2-5 bps range, depending on what the VIX is doing. At the same time some of the wider single name constituent outliers have 25-50 bps bid-offer spreads. If one recomputes the Index basis using tradeable bid/offer levels instead of mid levels, the negative basis become even wider. 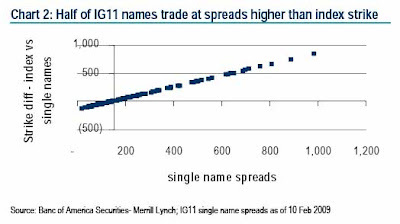 IG11 trades with Ex-R restructuring language, while single names are usually traded Mod-R, which is also usually substantially more liquid. One can interpolate the Ex-R:Mod-R relationship, and the 40 bps basis is calculated using Ex-R Single name spreads, however, the very existence of this dichotomy could generate ongoing basis aberrations as clients are more focused on relevant restructuring contract language. Additional single name technical pressure has arisen from the need to manage jump risk (for both managers and broker/dealers) due to risk managers finally waking up, as well as the continued market disruptions from ongoing CLO unwinds. The result is that index arbs, which used to game the positive basis actively in "Pre-Lehman", will likely be out of the market for a long time, and if any of them have not yet fully unwound existing positions, they will likely be in for a continuing world of pain. Busy day for bankruptcies. Aleris, which was in preparation to file bankruptcy, finally pulled the plug today. Can't be good for recent P/E purchaser Texas Pacific Group (or TPG, kinda like the whole Kentucky Fried Chicken and KFC situation), which, it seems, didn't feel like bailing out its December 2006 acquisition. Apparently the company managed to get a $1,075 million DIP (at L+1000) from its existing bank group. 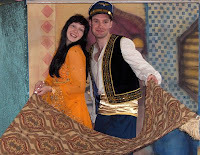 Aladdin Capital's services again were not put to good use. To fund its global operations during the restructuring, Aleris has secured $1.075 billion of debtor-in possession (DIP) financing. Subject to court approval, the DIP credit facilities include a new $500 million term loan and a $575 million revolving credit facility that replaces the Company's previous revolving credit facility. These will be used for the Company's normal operating and working capital requirements, including employee wages and benefits, supplier payments, and other operating expenses during the reorganization process. The Company believes that the DIP credit facility provides sufficient funds for its reorganization effort under Chapter 11. Oh well, one more aluminum fabricator bites the dust. Good news for debt-free KALU. Fitch Ratings-London-12 February 2009: Fitch Ratings has today downgraded Ukraine's Long-term foreign and local currency Issuer Default Ratings to 'B' from 'B+'. This reflects increased risk of a banking and currency crisis in Ukraine, due to intensified stress on the financial system and greater risks to successful implementation of Ukraine's IMF-supported programme. The Outlooks on both IDRs are Negative. The agency has also downgraded the Country Ceiling to 'B' from 'B+'. The Short-term foreign currency IDR is affirmed at 'B'. "The political consensus needed for Ukraine to adhere to its IMF-backed programme is fragile, while the global and regional macroeconomic environment has deteriorated further since the previous downgrade in October 2008," says Andrew Colquhoun, Director in Fitch's Sovereigns Group. Stress on Ukraine's heavily-dollarised financial system has intensified. Local-currency (UAH) deposits in the banking system fell 7.4% month-on-month in January 2009, while FX deposits fell 2.2%. The central bank (NBU) has taken six banks into administration. Fitch has downgraded the Individual ratings of six banks since October 2008. The NBU has announced that larger banks so far audited need an additional UAH22bn in capital, around 2% of projected 2009 GDP. More will be needed as smaller banks are audited, while a further deterioration in the economy or a sharp fall in the UAH could increase the requirement, and potentially the call on the sovereign to provide the resources. The UAH remains under downwards pressure. The NBU has come under political pressure to stem the currency's depreciation,even at the cost of draining reserves, which fell to USD28.8bn by end-January 2009, 24% down from an end-August 2008 peak of USD38.1bn. A full banking and currency crisis would damage the real economy and the sovereign's financing options, directly impairing sovereign creditworthiness. The sovereign faces a USD0.5bn eurobond maturity in August 2009, and a possible additional CHF768m in September 2009 if holders choose to exercise put options. The sovereign's ability to service this debt remains supported by reserves of USD28.8bn, although Fitch is concerned that willingness to pay may be eroded by a full financial crisis. The credit market is on fire, as is proof that greater fool theory is alive and well. Yesterday saw the placement of 3 high yield issues at a much more reasonable original issue discount, and yet accounts were swarming like flies on excrement with lipstick. All three issues have immediately generated about 1-2 points return post break, leading many original allocators to flip their holdings to naive secondary market bidders. 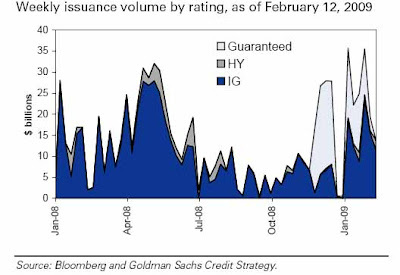 With equities and treasuries both now considered "unreliable" investments, and investment grade trading at October spreads (IG11 at 197 last), it seems HY is the final bubble available to plunk any excess cash, before everything goes to hell. HCA's $310 million 9.875% BB-/B2 second-lien notes due 2017 was placed at 96.67, now bid at 98.5. In the corporate realm it is good to see investors heeded our advice about the increasing default risk at Continental. The sovereign arena demonstrates the theme of continuing deterioration in Eastern Europe and Korea. Credit Agreement – The Company generated $218.8 million of cash from operating activities during the fourth quarter of 2008, and had approximately $484 million of cash and cash equivalents at December 31, 2008. Despite the positive generation of cash during the fourth quarter, continued deteriorating business conditions in certain of the Company’s operating segments and the impact of historical fixed charges incurred on a trailing twelve months basis (for example, interest expense, cash taxes, share repurchases and capital expenditures) may likely cause the Company to be in violation of the consolidated fixed charge coverage ratio covenant under its credit agreement as early as the end of the first quarter of 2009. As a result, the Company has initiated discussions with its lead banks seeking to obtain a consent and/or amendment to its credit agreement. The Company will endeavor to obtain the consent and/or amendment during the first quarter of 2009 in order to avoid any potential default under the credit agreement. Should the Company not be able to obtain such consent or amendment, there could be adverse consequences to the Company’s liquidity. Basically the company is saying its fate, even though it has a lot of cash, and generates free cash flow, will soon be in the fate of its banks. The culprit is the Fixed Charge Coverage Ratio covenant, which, as defined in the original Credit Agreement dated July 14, 2006, prohibits the company's Fixed Charge Coverage (as defined) to drop below 1.25x. 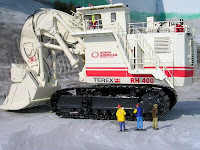 As the company does not have a significant debt load, at only $1.5 billion on $960 million of LTM EBITDA (although likely rapidly declining), it will be curious whether the banks play ball with Terex and give it some more time to turn the business around. It was already a full time job for investors to keep track of the government’s many new programs and their acronyms. Now, there are not enough hours in the day to monitor the Congressional hearings. The more time spent by the Treasury Secretary sitting in front of lawmakers, the longer it will take to formulate the details that the market is desperately craving. Considering the acrimonious environment in Congress these days, Geithner’s lack of details in advance of two days of testimony probably worked to his advantage. Had he shown more of his cards, there would have been greater complaints. Transparency is a good thing but as Washington runs these hearings, the overlap and redundancy is the epitome of waste. How many times must the same questions be answered? One can understand that the same questions may be asked at different hearings (although a little research would prevent that from happening). Hearing the same questions asked repeatedly in the same hearing is more painful than watching this market during one of its characteristic meltdowns. In today’s banking hearing, many legislators were knowledgeable but the number of others who were ill-prepared or lacked basic knowledge was alarming. Some just chose to do their grandstanding so they could pass the disingenuous message back to their constituents that they were tough on the bankers. As much as those individuals talk tough, they are not the free marketers truly willing to deal with the ramifications of a world without TARP. The fact that so few still fail to grasp the programs’ goals is frustrating. How many times must it be explained that the banks are only responsible for 30%-40% of the lending and the shadow banking system is responsible for the balance? On a side note, that is why the Fed is opening the TALF to hedge funds. This economy is in no position to discriminate against available risk capital. There was a ray of hope when Representative Patrick McHenry posed the question “…is your first obligation to your depositors, to your board, to your investors? Is your first obligation the safety and soundness of your institution?” The resounding response across the board from the bankers was “safety and soundness.” McHenry concluded, “I think we have completely resolved whether or not the TARP funds were for you to simply lend or for the safety and soundness of our financial system.“ It is little consolation, but at least one of the 535 members of Congress understands the purpose of the TARP. Hopefully, he will pass it on to his colleagues. A common query among most equity market participants is when is it time to buy. Timing a market bottom is usually a very dangerous play and it traditionally makes sense in the context of cost averaging down (assuming one doesn't make a 20% return overnight), and of a significant liquidity backstop. In other words neither we, nor any responsible financial advisor, will ever recommend betting even half the farm on a hunch, based on technicals, fundamentals, tea leaves, kaballah or other sound investing methods. The current market environment is unique in that since essentially the entire non-financial equity world trades as one asset class, on huge momentum swings, and with the mania of an overcaffeinated daytrader, i.e. with a lot of embedded risk, one could flip the argument and claim the reward should be commensurate. This leads to the question of what are the key criteria that analysts, pundits and talking heads look at when the make bold market bottom claims. We present a list of conditions, which while not exhaustive, provide a good framework to analyze whether conditions are ripe for a substantial move up (or down). 1. Is forward looking data bottoming? The equity market tends to bottom when the deterioration in the labor market and economic growth are at their worst. The S&P historically bottoms near a time when new unemployment claims are at their highest levels. Another major metric followed by forward-watchers is the reading on the ISM (Institute for Supply Management), or the manufacturing index, which measures manufacturing activity. 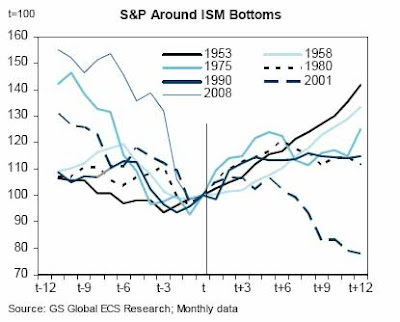 Again based on historical data, the S&P has usually bottomed one or two months before an ISM inflexion. As the chart below demonstrates out of 8 economic cycles, the only time this did not occur was in 2001, after an ISM low of 40.8 was hit in October with the market proceeding to sell off for another 15 months. It is arguable that the post 2001 bubble was an aberration resulting from the double whammy of the still lingering Internet bubble and the "one-time" event of September 11. For the current cycle, the ISM hit a 28 year low of 32.9 in December and staged a modest rebound to 34.9 in January, which would imply based on empirical data the S&P bottomed in November. It is important to remember that the absolute value of the ISM is not so much the determinant here as its derivative, i.e. the bottoming out. A March ISM reading higher than 34.9 by even 1 point would likely incite a substantial market rally. Then again the ISM reading is so low that it is debatable how valid its indicative power is at these significantly depressed levels. And we would strongly caution a singular focus on ISM as employment numbers keep deteriorating, and we believe that metric is substantially more relevant from a forward looking perspective. The combination of a flattening in both ISM and new unemployment claims would undoubtedly cause a significant market rip. 2. Are foreign economies stable? When we wrote about the Russia, Eastern Europe and Korea recently, we were focusing on their capital market deterioration. However, it is only a matter of time before that weakness spreads to the overall economy (and neighboring countries). While recent foreign business surveys have shown improvement along some metrics, the overall foreign data are conflicted, with recent deterioration being observed among global trade routes, most notably in Asia. There is also a second issue: investors may have be overoptimistic for a rebound in EMs: the YTD Brazil index is up 8% while China A-shares are up 24%, thereby pricing the "good" side of the news. The inflexion point of the business cycle will inevitably present good and bad data, although care has to be taken to analyze the potential risk of the credit crisis' spread catching up with more important lagging indicators. 3. 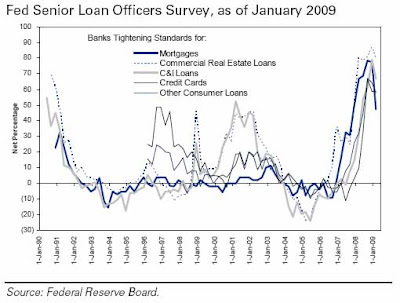 Are lending conditions improving? 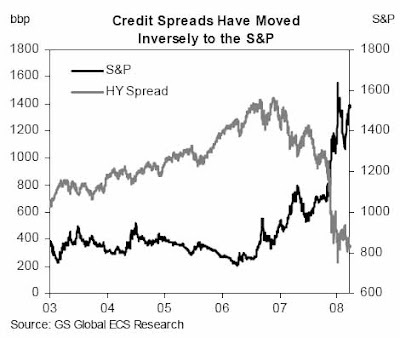 Empirical data shows a very close inverse correlation between the S&P and the spread on the HY index. While spreads have tightened over the past 3 months, a lot of this has to do with the pricing in of the recently announced Finance Stability Plan, which at this point may only lead to further disappointment. For a sustainable rally, credit spreads, especially for high yield names, have to collapse by a substantial amount which will likely be contingent on many of the postulates of the FSP kicking in. Other credit improvements such as a decline in write downs would be a welcome metric. Of course, to keep things confusing, January was one of the best month in history from a new Investment Grade debt issuance stand point. 4. Is the Finance Stability Plan effective? Arguably the most critical part of a sustainable market rally, the Fed and Treasury's new plan has three main goals: i) Monetary easing, which at this point can go no lower with ZIRP already in place. Additionally the Fed is now involved in quasi-fiscal policy by purchasing treasuries (presumably), mortgage backed securities and other risky assets, bringing spread tighter. ii) Fiscal stimulus, with a redesigned $780 billion stimulus package on the verge of implementation. This will provide a needed short-term temporary boost to spending and aggregate demand, at the cost of significant government indebtedness and inflation hazards down the line. iii) Bank rehabilitation. Arguably the weakest point in the government's interventionist practice, due to the FSP's nebulous treatment of bad assets via a new version of TALF, as well as ongoing asset value deterioration, leading to increasing threats of systemic banking insolvency, and raising the specter of nationalization. Furthermore, the lack of disclosure on many of the FSP's tenets will not be read favorably by investors, and is an indication that the policy response is still a substantial work in progress. 5. Is the housing sector stabilizing? Pundits have been so focused on the first derivatives of this problem that they ignore just how bad the property markets are and likely will be for an extended period of time. For a true economic pick up, the housing sector needs to stabilize: plain and simple. 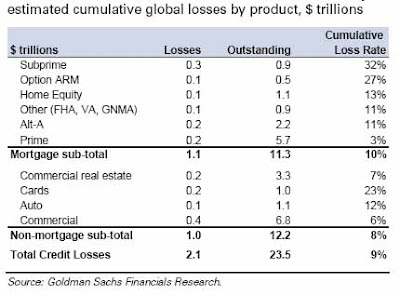 Goldman estimates that if home prices are to decline a further 25%, this would result in an additional $742 billion in credit losses on credit products. Any indication that home prices are falling at a less rapid pace could be perceived as a sign of an inflexion point approaching. So far there is no evidence of improvement in prices and with a 12.9 month inventory overhang, it is not likely that a bottoming is approaching any time soon. The preliminary assumption that the S&P 500 may have bottomed in November has so far been consistent with technical analysis - the market has been trading in a very tight range in the 775-850. This article will not delve into the technical aspects save to say, that the current level on the S&P may be priced surprisingly well given all the above 5 criteria. Investors should compare improvement versus deterioration in all five to determine what the impact will be over the coming several months. Barry Minkow strikes again - Patrick Avery, President and COO of fertilizer maker Intrepid Potash was made redundant today after Fraud Discovery Institute earlier announced and later the company confirmed that Avery had previously lied about two college degrees. Avery was hired in December 2007, and according to the company's IPO prospectus he holds a B.A. in Biology and Chemistry from University of Colorado, an M.S. in Engineering from Loyola, and an MBA from Pepperdine. South Korea's second-largest bank Woori spooked it debt investors today after announcing it would not exercise a widely anticipated call of its $400 million of Tier-2 sub notes due 2014. As a result the company's CDS spiked 100 points wider to 830, while concurrently the price on its Tier-2 Notes due 2014 dropped from 89.5 to a record low 79.5. Woori is the third bank to not call a Tier-2 note, after German Deutsche Bank in December and Spanish Banco Sabadell on February 4. Bloomberg notes, "Their decision just destroyed the trust and confidence investors have” quoting Arthur Lau, a fund manager in Hong Kong with JF Asset Management. Some strong January numbers from mostly tech names as the bloodbath in Russia and Eastern Europe persists. 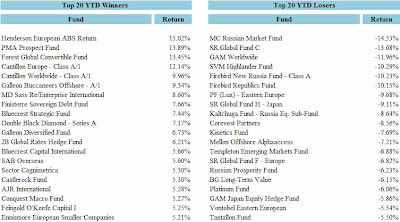 Many funds continue to not report YTD numbers for obvious reasons. Meriwether, Zimmerman, Gendell, Weinstein... Seems hedge fund managers really have no transferable skills as all they can do is beg for more money to burn. However, it really starts to hurt when you realize that not only can you not raise a new fund, but you very well have to jump from interview to interview and wait for that 3rd round call back late into the night and, (if lucky) work for some other portfolio manager (or heaven forbid trader). Such is the fate of former distressed debt god Dan Zwirn, who was one of the more impressive flame outs of early 2008, at a time when the credit crisis was only in its warm up acts. According to today's Hedge Fund Alert, Dan Zwirn, whose DB Zwirn Co. fund was a $10 billion heap of toxic 2nd lien assets at is peak, has "updated his resume and is looking for fund management work. He already has held discussions with several firms." Looks like his attempt to raise a new fund, ZLC, has met with spectacular failure. 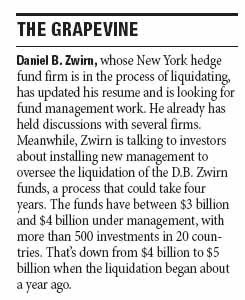 What is appalling is that he is trying to leave DB Zwirn at a time when the fund is only about 20% done with unwinding its ultra illiquid assets, and "is talking to investors about installing new management to oversee the liquidation of D.B. Zwirn funds, a process that could take four years." Nothing like leaving your existing employees to sort out the mess you created. The 37 year old, who is clearly missing the glory days of corporate jetdom, was last seen waiting to hear back from headhunters if they had any medium-level analyst openings. While Tim Geithner provided more questions than answers yesterday in his presentation of the latest version of the "Finance System Bailout Plan", it makes sense to analyze the data that was in fact given to the general public. iii) a modification of the Term Asset-Backed Securities Loan Facility (TALF) being increased to $1 trillion, and adjusted to include a wider variety of assets. - Will small banks be allowed to participate and under what conditions? - What defines a stress-test and how is it administered? - What happens to companies that do not meet standards? - What are the terms of the contingent capital to be provided? - How will capital be attracted, on what terms, and how will it be structured? - How will asset-prices be established, and what are the conflicts of interest? - What are any residual contingencies that would not be assumed by the buyers? The Term Asset-Backed Securities Loan Facility, or TALF, is being brought back with a bigger role this time, in order to attempt a resurrection of the securitization market. The assets that can be included are broader, and the total size has also grown to $1 trillion. - Under what underwriting standards will TALF securities be sold to investors? - Is TALF attractive enough to stimulate new lending? - What is the incremental leverage used and is there a downside protection case: To investors, to taxpayers? 696 individuals received bonuses of $1 million or more. What this means is that the populist wave will now turn away from compensation at banking executive committees, which may or may not be capped at half a million, to those traders, analysts, advisors and brokers who actually make money for the firm, and as such will have their bonuses scrutinized with a fine-toothed comb. It also implies that all those JP Morgan Managing Directors who were hoping to fly under the radar while they were earning 20 times more than Jamie Dimon, are about to get the royal boot. Realizing there is an unmet need for DIP and rescue financing as well as for more oddly named hedge funds, Aladdin Capital has recently launched a Debtor-In-Possession only fund. The Stamford fund, which claims to be avoiding the current Treasury bubble, yet which in January sacked virtually all people in its structured bond business (CLO and Loan obligation desk), likely the biggest bubble over the past decade, hopes to be on the leading edge of the next bubble, this one in super senior bankruptcy lending. The logic goes that as nobody, not even Goldman is willing to let the L+1000 DIP Genie loose, this should make for a terrific niche. Of course the logic does ignore the fact that even with DIPs, most bankruptcies will imminently lead to liquidations (how many Sharper Image massage chairs does one honestly need). So for all those who believe in a magic carper ride over the credit market bottom, and have a necrophiliac fascination with DIP lending and extracting 20% before an existing DIP has to be primed by yet another DIP (see Delphi), please send your resumes to Aladdin credit fund managers Victor Russo and Luke Gosselin. It was only three weeks ago that Istithmar had put Barney's on the chopping block expecting to get not less than its full cost of $942 million. Well it didn't take long for them to realize that they would need to have Buffett's investment horizon in order to monetize at that offering price. As we speculated, the sale was borne out of a substantial need to raise cash, and as such it is quickly progressing into a full blown firesale. According to Bloomberg, 4 people familiar with the sale process have said bids are coming in the $350 to $600 million range, meaning Istithmar, which is owned by government owned Dubai World, will be lucky to get half of the price it paid for the ultraluxury retailer. Despite some muddled explanations from its administration on how Russia may or may not be in fact filing for private sector (but definitely not sovereign) bankruptcy, this story shows why some sort of default is imminently unavoidable as essentially the entire Russian private sector is now shut out from the primary bond market, with no foreign bond issues since August 2008. Russian companies, the biggest emerging-market borrowers during the last three years, are shut out of the international bond market after yields jumped sixfold since August amid plunging energy prices and a weakening ruble. No Russian company has raised money through foreign bond sales since August, compared with $80 billion raised by more than 200 companies in Latin America and Asia outside of Japan, according to data compiled by Bloomberg. Yields on bonds due next year from Moscow-based Transcapitalbank and JSC AIKB Tatfondbank in the Russian republic of Tatarstan are trading at yields above 80 percent, up from 12 percent in August. The credit squeeze will force companies to rely on government bailouts to refinance their debt or face default, according to MDM Bank, VTB Group and Commerzbank AG. International banks proposed talks with Russian companies that owe $400 billion in the next four years, the Russian Association of Regional Banks said yesterday. Is it too early to watch the fire? Semi-government owned Troika Dialog of course seems to think so. After all, not a lot advisory and broker dealer business going down when your country is bankrupt. While investors “fear massive defaults” on some of the $100 billion of Russian debt due in 2009, the concern is “overstated,” Troika Dialog analysts Andrey Kuznetsov and Kingsmill Bond in Moscow wrote in a research note on Jan. 19. Companies have between $20 billion and $30 billion of their own funds, will borrow between $30 and $40 billion from the government and will rollover another $30 to $40 billion of debt this year, according to the note. “The shortfall is likely to be in the region of $10-$20 billion, but this is more likely to damage the weaker credits among smaller banks” rather than big corporations, the Troika Dialog analysts said.